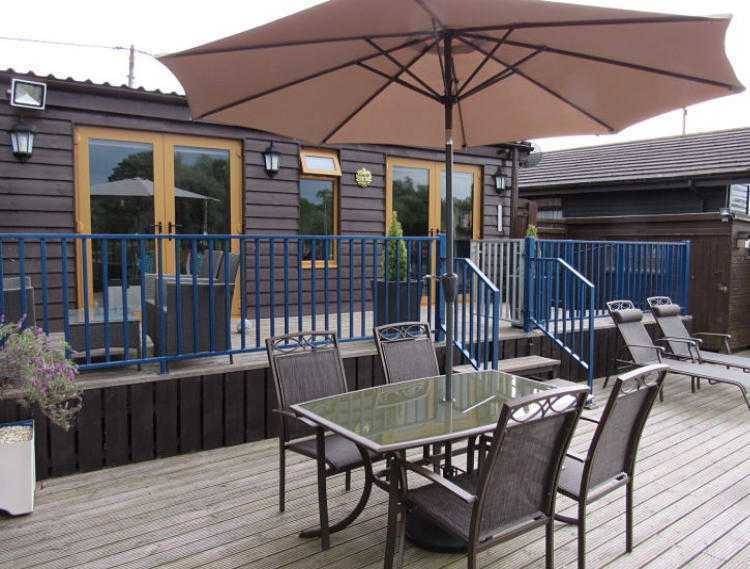 Although our Norfolk Broads holiday cottage is a ground floor property it may not be suitable for people with disabilities or wheelchair users. There is a ramp from the parking area to the upper decking but there are steps down to the lower decking. The main bedroom has a king size bed with a selection of different tog duvets. There are fitted wardrobes with plenty of storage and hanging space. In the wardrobes are the safe, bean bag, iron, ironing board, two fans, a clothes horse, a spare heater and a vacuum cleaner. The main bedroom has a wall mounted television with Freesat and a DVD player. There is a set of drawers with a hair dryer and plenty of storage. A travel cot can also be supplied on request. The twin bedroom has two 2ft 6in single beds with a selection of different tog duvets. There is a wardrobe with hanging space and a set of drawers. In the bottom of the wardrobe there is a selection of games for the children. The bathroom consists of a basin, toilet, and bath with a separate shower above the bath. There is also a small storage cupboard. Complimentary toiletries including shampoo and conditioner, shower gel, hand and body lotion, hand soap, shower cap and toilet rolls are supplied to get you started. The lounge has a four seater sofa with a separate foot stool. The wall mounted large LED television has Freesat, a DVD player is also provided with a large selection of DVD’s to suit all tastes. There is a book case with a selection of books, binoculars and leaflets of things to do during your holiday at Swallowdale. There is also a radio/CD player. The kitchen is very well equipped with everything you will need from a pizza cutter to a Yorkshire pudding tin. The kitchen has an electric cooker with separate grill, an induction hob with a selection of saucepans and frying pans, toaster, steamer and a microwave oven. There is a dishwasher and fridge in the kitchen. The freezer and washing machine are in the shed. Tea towels and an oven glove are provided along with small amounts of salt, pepper, oil, vinegar, tea bags, coffee and sugar. Also small amounts of detergent for dishwasher and washing machine, bathroom and kitchen cleaning materials and kitchen roll. There is free wireless internet access at Swallowdale holiday cottage, so don’t forget to bring your tablets, laptops and smart phones. The WiFi password is in the guest book. Please note that mobile phone reception varies considerably depending on what network you are with. The Cottage uses electricity for all heating, hot water and cooking, and is fully included in the cost of your holiday, as is all water consumed during your stay. There is a BBQ at Swallowdale for your use. Charcoal, fire lighters, matches and cooking utensils are supplied. All bed linen, hand towels and bath towels are provided. Although Swallowdale is self catering, we do provide tea towels, an oven glove and apron. An umbrella and torch are also there if needed. Salt, pepper, vinegar, oil, detergent for the dishwasher and washing machine are included. We hope you Enjoy your holiday in our Norfolk Broads holiday cottage!